Should You Hire A Company To Hang Your Kalamazoo Christmas Lights? Should you hire a company to hang your Kalamazoo Christmas lights? If it’s within your budget, why not?! There are some great reasons why people hire companies to hang Christmas lights, and there are reasons why people would never consider it. If you’re on the fence about having a Kalamazoo company hang Christmas lights for you, here are some beneficial reasons you may want to switch to the *light* side, and what you should consider before getting an estimate. Space – Sick of looking at container, after container…after container of Christmas stuff? 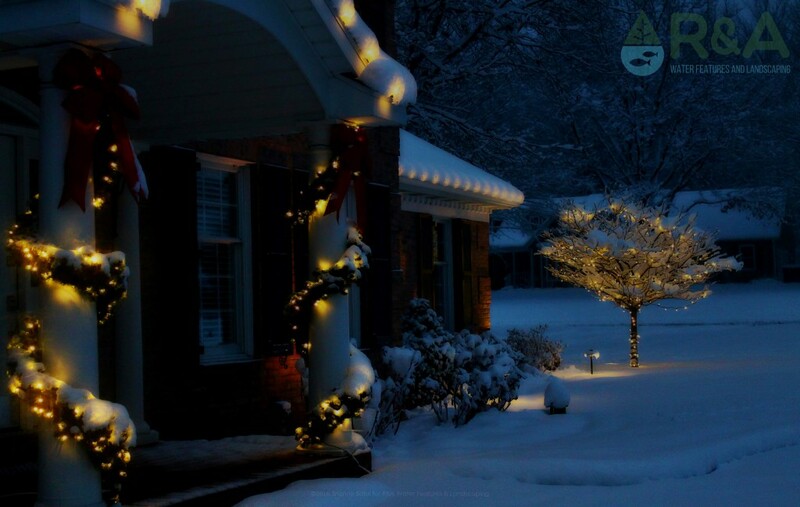 When you hire a professional company to hang your Christmas lights in Kalamazoo, you don’t need to worry about storing your lights or decorations, that’s all taken care of. Safety – Get off that ladder already!! You won’t need to do any of the high climbing, or heavy lifting, to put up Christmas lights and decorations…or to take them down for that matter. You can kick back in that comfy chair while sippin’ on your hot cocoa (or pumpkin spiced latte…whatever you prefer). No more widow-maker ladder for you, your significant other will be grateful. Homeowners and businesses hire companies to hang Christmas lights for a variety of reasons; little to no time, traveling, health related concerns, or because they simply just don’t want to deal with any of it. Whatever reason it may be, you should determine the following from the very start. Budget – Always, always, always have a budget in mind. Determining the minimum and maximum your willing to spend on holiday decorations will not only help you set personal spending limits, but it also helps the person giving you an estimate to find a Christmas lighting display that will work within your budget. 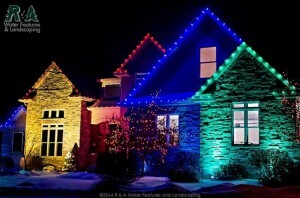 Lighting – Where you want Christmas lights is also an important determining factor. Do you want just the roof lines, are you thinking about adding gables as well, what about wrapping columns with lights? Deciding what you want lit will have a big impact on the overall cost of hanging Christmas lights. You can also think about color. Are you more traditional and want only white, or do you want to be adventurous and mix up a few different colors? Also consider your landscape and what you may want included, like small ornamental trees, shrubs, or that big tree you love that makes an even bigger statement. Additions – When I say ‘additions’ I’m talking about items that can turn your ‘Christmas lights’ into a Christmas display. Additions can be anything that adds that extra dash of awesome, like greenery, bows, column drops, flood lighting, wreaths…anything really. So, think about the additions you really want, ones that you might want, and other that aren’t all that important to you. After you’ve considered the above items, be sure to contact a reputable and professional company to hang Christmas lights. Not all companies are the same either…some companies let you rent the lights for the season, while with others you own the lighting you purchase and only pay for the installation in subsequent years. Determine what would make the most sense for you in the long run. 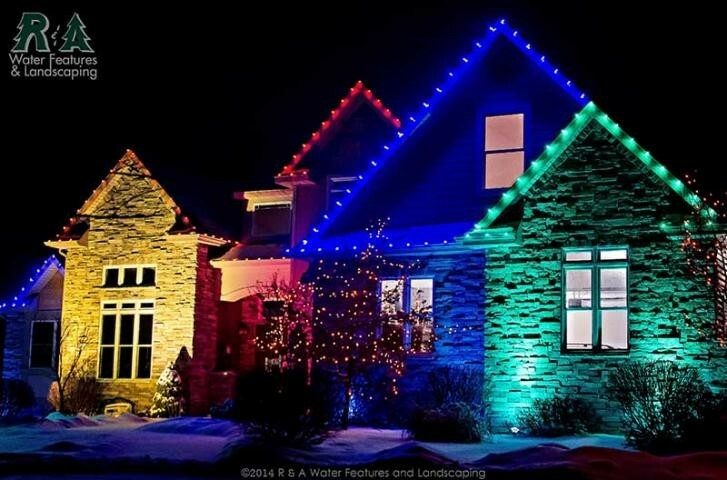 R&A Water Features & Landscaping professionally hangs Christmas lights around Kalamazoo, Grand Rapids, and the surrounding areas. Visit our holiday decoration blog to find great ideas, tips, and inspiration. To learn more about our holiday decoration service, click here, and be sure to contact us today to get started on your holiday decoration project!